Susceptibility-weighted imaging (SWI) increases the conspicuity of venous structures within the brain.1,2 However, there are no reports of its usefulness in the detection of cranial dural arteriovenous fistulas (DAVF), which may be less conspicuous on conventional MR imaging sequences. We report the case of a patient with DAVF, which was imaged with SWI in addition to the conventional MR images. A 63-year-old man presented with gradual-onset, slowly progressive, painless bilateral visual loss of 4 months’ duration. There was no history of tinnitus. On examination, only perception of light was present bilaterally, and the fundus showed papilledema on either side. Ocular movements revealed weak abduction bilaterally. Pupils were equal and sluggishly reacting to light. No other localizing signs could be identified, and no cranial bruit was detected. 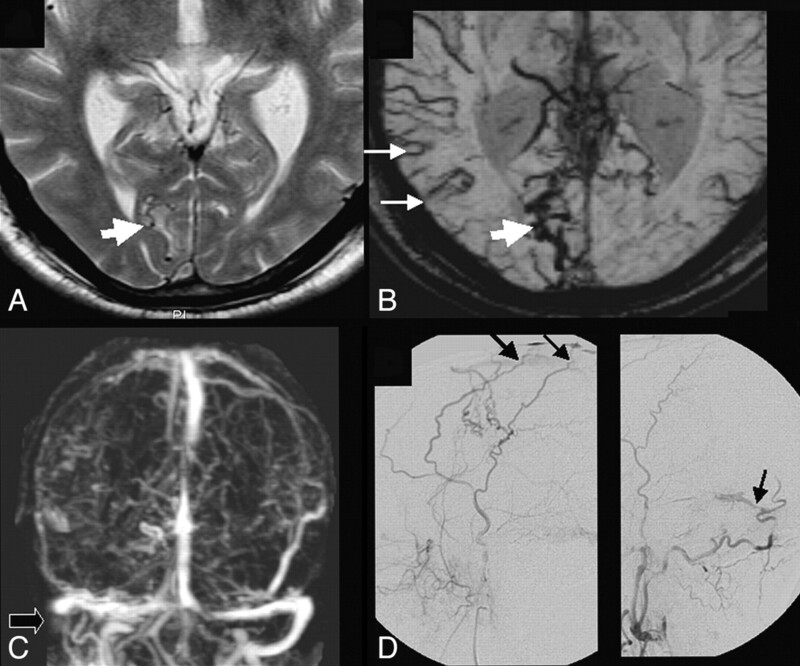 Axial T2-weighted MR imaging was equivocal (Fig 1A), but SWI with minimal intensity projection showed very conspicuous venous vasculature of the entire brain, more on the right, with prominent collateral venous channels in the right occipital region (Fig 1B). Dynamic contrast-enhanced MR venographic study demonstrated occlusion of the right distal transverse and sigmoid sinuses (Fig 1C). A digital subtraction angiography (DSA) study revealed multiple DAVF in the superior sagittal sinus and the right transverse sinus, with feeders noted from right middle meningeal, superficial temporal, and occipital arteries with delayed cerebral venous drainage (Fig 1D). SWI correlated very well with the DSA findings. Diffuse prominence of the venous vasculature noted on the SWI could be explained by the prolonged passage time of the blood in the intracranial circulation from the functional obstruction caused by DAVF at the level of the venous sinuses. Therefore, this prominence possibly allows for increased oxygen extraction, which results in more desaturation of blood in the veins, which makes them stand out on SWI. Venous engorgement, which occurs in cases of DAVF, may also be contributing to this imaging appearance. The possible site of the fistula may also be inferred from the presence of a cluster of vessels, which can be very well visualized on SWI. Moreover, in this case, we noticed, after particulate embolization of the external carotid feeders, a significant reduction in the prominence of the cortical veins with improved cerebral circulation time and better filling of the venous sinuses on follow-up imaging after 1 week. The clinical features of DAVF range from vague symptoms such as headache, vertigo, or tinnitus to disabling neurologic deficits or a life-threatening intracranial hemorrhage.3 It may be difficult to diagnose DAVF at an early stage because of its nonspecific clinical and imaging findings. Therefore, the use of SWI may be helpful in the early diagnosis and prompt treatment in such cases. It may also help to differentiate between other causes of raised intracranial tension and may aid in assessing the posttherapeutic improvement in cerebral circulation. A, Axial T2-weighted image showing subtle tortuous flow voids in the right occipital region (thick white arrow). B, SWI minimal intensity projection image is showing abnormally conspicuous cortical veins more on the right side (thin white arrows) with a cluster of vessels in the right occipital region, thought to represent collateral venous flow (thick white arrow). C, Dynamic contrast-enhanced MR venographic study is showing the occluded right distal transverse and sigmoid venous sinuses (black arrow). D, DSA study revealed multiple dural arteriovenous fistulas (thin black arrows) in the region of the superior sagittal sinus and transverse sinuses.